Our Illuminated LED Vest is the most visible vest you can buy. It is highly noticeable both day and evening and the safest vest possible for visibility. This vest has been in product development for two years and great thought has gone into developing this vest. With the new technology for illumination we are now able to present this vest into the market place. The color of this vest is bright white but not to worry because the entire vest is covered in clear vinyl so it is very easy to wipe off any dirt or soil. 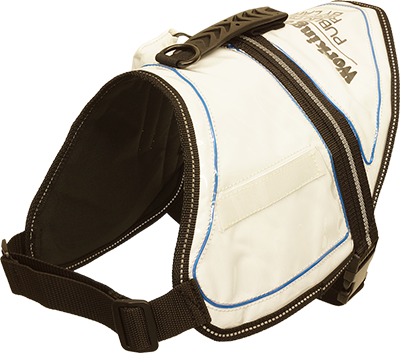 The Illuminated Vest has blue lights that encompass the entire perimeter of the vest and also over the dogs back as well. When you are working with your dog in evening hours the blue lights can be seen from blocks away. For those in a wheel chair situation safety is always a concern in evening hours because the dog and handler in the wheelchair are simply lower than the driver of a vehicle. The vest lights can be used in three capacities either constant on, flashing, or in slow strobe light. Very easy access to the lights switch for changing the desired setting. The battery pack runs on 2 AA batteries and they are included with the Illuminated Vest. Other features of this vest are adjustable chest and girth straps. The vest is comfort padded for the dog. Reflective safety webbing is all around the edge of the vest and additional reflective webbing is over the back of the vest. The handle is a soft grip molded vinyl handle with attached metal welded D-ring. The handle is attached to lay flat to the vest or it can stand up for use. Having the handle lay flap is a nice feature for when the dog needs to be under a table at the restaurant, under bus seat, or under school desk while working. On the side of the vest is a clear vinyl window pocket for your ID. Your ID will not slip out and be lost as the pocket opens and closes with hook & loop tape. The back section of the Illuminated Vest has large embroidery work that states: Working Service Dog---Public Access Require By Law. You can also order this vest with no embroidery work if you choose.